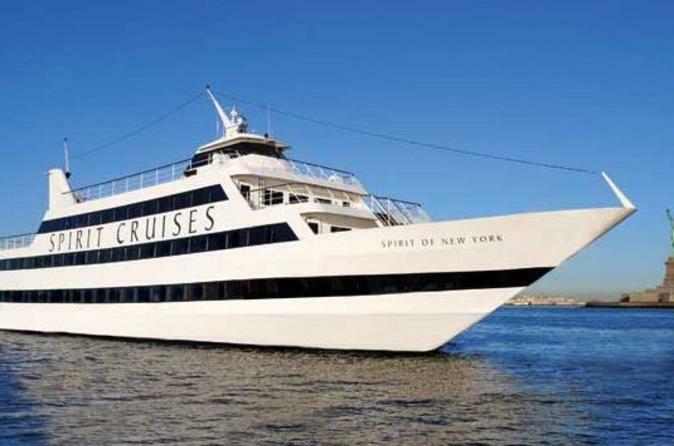 Indulge in an all-you-can-eat buffet as you take in the sights on this relaxing afternoon cruise in New York Harbor that includes DJ entertainment. Capture photos of landmarks including the Empire State Building, Statue of Liberty and Brooklyn Bridge while learning more about New York City and its numerous attractions from informative narration. Upgrade to receive a welcome glass of champagne in a souvenir flute, platinum open bar, and a table for your party size. Board your ship at Chelsea Piers on Manhattan's west side. As you do, smile as a photographer takes a keepsake photo of you and your party that you can purchase later if you wish. Let the friendly staff guide you to your table for your lunch cruise. If you've chosen the upgrade option, sip Champagne from a souvenir flute and take in the view from your guaranteed window table. Admire the hustle-bustle of New York City as you enjoy the laid-back ambience of your cruise around New York Harbor. Head to the buffet as often as you like to fill up on classic American fare (see Itinerary for a sample menu). Walk around the ship or lounge at your table as you listen to narration about the sights you see from the panoramic windows. Have your camera ready for share-worthy shots of top New York attractions including the Empire State Building, Brooklyn Bridge, the Freedom Tower, South Street Seaport, Governors Island, the Statue of Liberty and Ellis Island. DJ entertainment helps keep the mood light and festive. If you've chosen the upgrade option, savor drinks from the premium open bar in addition to the buffet. Your 2-hour New York City lunch cruise concludes at Chelsea Piers.